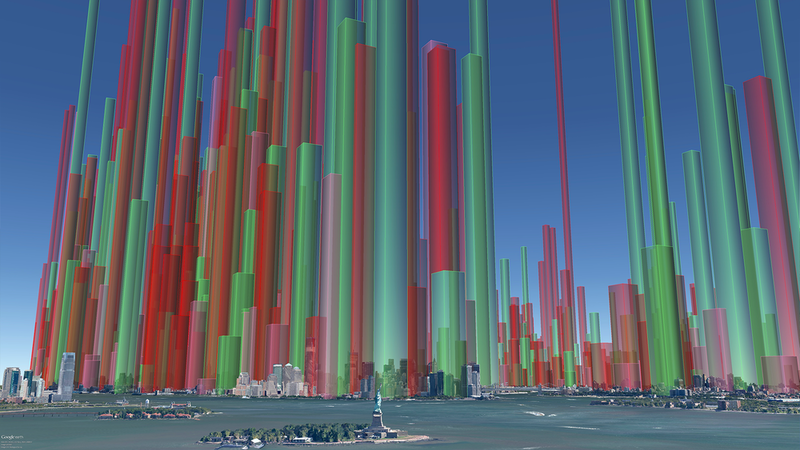 We at Real World Visuals have been working on ways to visualise air quality for some time, which also means understanding the different reasons for visualising it. Some of the time we want to show what air quality is like right now. That's what our particle visualiser (above) is designed to do. Visualising current conditions is important for people who already understand the risks and want to take steps to protect themselves, but visualisation has a role in planning and mitigation also. In a sense, if you need to visualise ambient air quality you have already failed. We believe visualisation should also help avoid pollution becoming a problem in the first place. In this blog we present some early sketches based on numbers from a report commissioned for a planning enquiry*. Quantifying emissions does not provide much insight by itself. On the other hand, quantifying the atmospheric ‘services’ required by an emitter is much more useful to decision makers in a planning department. We still see value in visualising absolute quantities of pollutants and visualising concentrations of pollutants, but we have come to realise that we can provide most insight by visualising air itself. That is, we have set out to answer visually the question: how much clean air does this emitter need to dilute its emissions to safe levels? This gives an immediate, intuitive sense of how viable an emitter is in any particular environment. According to the consultants’ report, a typical cruise ship docked at Enderby Wharf would emit 1.4 million m3 of exhaust each day (15.7 m3 per second). This set of sketches was inspired by a Costing the Earth programme BBC Radio 4, which highlighted the problems of air pollution from cruise ships docked in Southampton and Greenwich, London. Greenwich Council has approved plans for a cruise ship terminal at Enderby Wharf, so we looked at a Technical Report prepared for the planning process just to get a sense of what the numbers ‘look like’. First we looked at how much exhaust the ‘typical’ cruise ship represented in the report emits each day (see above). Much of the exhaust is just normal air plus a bit of relatively benign carbon dioxide and water vapour, but a significant amount of it is oxides of nitrogen and sulphur. It also contains particles. The exhaust from the cruise ship also contains oxides of nitrogen and sulphur, and particles. The cubes show the actual volume of the gases (at a pressure of 1 atmosphere and temperature of 15 °C) emitted over 24 hours. These toxic gases and particles need a lot of air to dilute them until they are at levels safe enough to breathe. 22 kg of sulphur dioxide may not seem much, but if not dispersed it is enough to do a lot of damage. One way of quantifying the damage is the number of people it could potentially affect. It turns out, that a cruise ship adds a quantity of SO2 to the air that is equivalent to the maximum daily dose for 16 million people, which is fine as long as there is enough air to dilute it. So how much air do the emissions need to dilute them to safe levels? The oxides of nitrogen would need 19 cubic kilometres of air each day to dilute the NOx to a concentration of 40 μg/m3, which is the air quality objective annual mean concentration. (Note that this assumes that all the NOx is eventually converted to NO2. The Environment Agency assumes 70% of NOx is converted to NO2, so we should probably reduce this volume by 30% to 13 km3. London’s air already carries a heavy load of NOx, SO2, PM10 and PM2.5 pollution. The consultants' report provides figures for cruise ship they deem typical. Elsewhere in the Report the cruise ship Crystal Symphony is mentioned as the largest that can get into the new dock. This vessel would emit 2.5 to 3 times as much NOx as shown in the images. An argument used by supporters of the terminal was that the vessels would be using 'low sulphur' diesel which is ‘very similar to automotive diesel’. This is misleading. Since 2009 in the EU the maximum sulphur content for automotive diesel has been 10 ppm, which is 10,000 times less than ‘low sulphur’ marine diesel (we are looking at creating an image to show this too). The problem of excessive air pollution from stationary cruise ships in cities is however easily solved by installing shore-to-ship power systems, so the national grid can be used and onboard diesel power is not required. In Europe, ports such as Gothenburg, Lübeck, Oulu, Zeebrugge and Antwerp have installed such systems. In North American cities such as Los Angeles, Long Beach, Seattle, Juneau (Alaska) and Vancouver have already implemented shore-to-ship power in close cooperation with the shipping industry. Princess Cruises, a subsidiary of Carnival Corporation, has fitted eight ships with shore-to-ship power capability and has plans to retrofit to the entire fleet. There are several suppliers who can install such systems on vessels and at UK ports. HAS THIS VISUAL METHOD BEEN USED BEFORE? 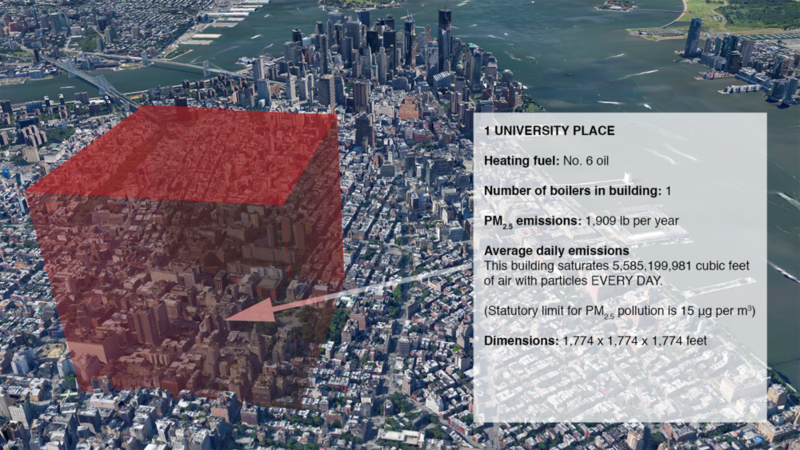 We used this same methodology three years ago to visualise data from the Clean Heat project - helping New York property managers, building co-op boards and community groups reduce local air pollution from their buildings. See here for more details. The simple images above begin to explore ways of making these numbers meaningful for decision makers and stakeholders, but there is more work to be done. They have given us important starting point for visualising sources of pollution - not just ambient conditions. We can see ways of improving their impact and their readability. An animation would help us unpack the story. Showing both emissions, and air needed to accommodate them, in real time would also help a viewer see just how polluting a source is. For cruise ship air pollution our aim would be to use similar images as the basis for a short animation that shows both the problem and the solutions. We are now actively looking for any applications where these technique can be used more widely to help facilitate better planning outcomes. If you think you can help please contact us on info@realworldvisuals.com. Finally a comment from one of the leading authorities in the field of allergy, both in the UK and internationally. * Report from the consultants Royal Haskoning DHV can be downloaded here. More information on the planning process of the Greenwich Terminal can be found here. 'Daily dose': On average, an adult breathes about 11 m3 of air each day. According to air quality objectives, over 24 hours the concentration of SO2 in air should not exceed 125 μg/m3 (125 millionths of a gram per metre cubed). That makes a daily ‘dose’ 11 x 125 μg, which is 1.375 mg. In other words, the quantity of SO2 a cruise ship adds to the atmosphere each day (22 kg) is equivalent to the maximum daily dose for 16 million people. Note: 'daily dose' is not a metric used in air quality regulation, it is just a way to get a handle on the numbers. 'Particles': Particle pollution is classified into three main categories: PM10, PM2.5 and PM1 , i.e. particles smaller than 10 microns, 2.5 microns or 1 micron. A micron is a thousandth of a millimetre.